If you’ve used bottles, you’ve experienced the terror of indecision as you attempt to choose one. The sippy/spout/straw cup aisle is no different. The plethora of choices and marketing make it near impossible to make a doubt-less decision. A. Do you want to use a sippy cup? Are they truly bad for development? B. Should you use a straw cup? C. When should you introduce it? D. What about an open cup? The sippy versus straw cup discussion has been beaten to death. Bottom line: sippy cups are parent friendly (spill proof) but do not promote mature skill development. If you choose to introduce one, it should be phased out 12-18 months. It’s pretty tempting to put your child to bed with a sippy cup when they can lay down and drink it without spilling. The consequence is an increased risk of dental issues and reliance on the sippy cup as a sleep aid! Additionally, from an oral-motor perspective, the spout of a sippy cup (hard or soft) encourages the tongue to come forward and blocks the front of the tongue from rising. More mature oral-motor skills include the ability to raise the front of the tongue and pull the tongue back (retraction). Drinking from a cup or straw requires greater lip activity and more independent tongue, jaw and lip movement than drinking from a bottle or a sippy cup. Bottom line – sippy cups may not be “bad” for development if you discontinue use around a year old. I suggest simply starting out with a straw from the get go – with the right straw container, a baby can be successful as early as 7-ish months and this is a life-long skill. No need to discontinue use. AND, babies can drink from them without having to tip them up to get flow! The down side is they are not spill-proof. Milk and water spills are inevitable. Start with a straw container that you can squeeze up the straw and deliver small quantities of liquid into your baby’s mouth when he puts his lips around it. You can squeeze less and less as he gets the idea of sucking. Expect a messy process.. typically the first reaction is to let the liquid fall back out of the mouth the first few times. Open cup drinking also allows for the development of more mature oral-motor skills. Cup drinking requires more independent tongue, jaw and lip movements than a bottle. Generally, open cup drinking needs adult support for a longer period of time than straw drinking. You can introduce open cup drinking at any time; think about matching the size of the cup to your baby’s mouth. A medi-cup is a great first open cup for young babies. 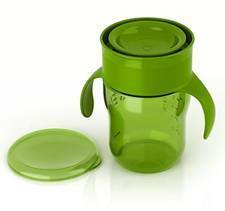 It can be easier for kids to learn independent cup drinking from a recessed lid (think kids travel mug with small hole to decrease the flow). Avent also has a natural drinking cup that opens the valve when the upper lip presses on the inner ring. The one below can be a nice option but I find it easier to introduce around the 9-12 month mark. Hope that helps to reduce stress when you head to the sippy cup aisle! I came across your blog while looking for help with some feeding issues with my daughter. She’s only 5 months old but breastfeeding has been super difficult since day one and she has developed a feeding aversion to both breast and bottle, resulting in slow weight gain and a lot of stress. In one of your posts you wrote about offering OT services in Calgary for feeding issues… do you work with babies this young and how can I get in touch with you? You bet I work with babies this young. I’ll send you a direct email but this is a good reminder that I need to get back on this blog and update things. Chat soon.